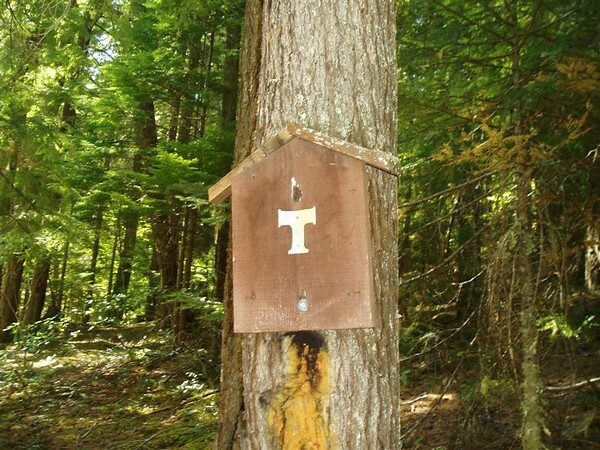 Rho Creek trail (#560): I got to the trail head about 10:30, and finally found the trailhead marker, an orange blaze and the old USFS marker with an aluminum T on it (placed there by the guy who has been trying to restore the trail). Very interesting trail, that is very faint in places, but reasonably well blazed. Between the flagging tape and the old trail blazes, I was able to stay on the trail pretty easily. The trail goes up, probably 1100 feet or more in its 4 miles, so you are going up all the time, but it is usually a pretty slow, constant up, rather than steep switchbacks. There is one section of switchbacks on the trail, though. It parallels Rho Creek, which is a beautiful little creek. There are a few spots where you can get down to the creek to get a better look at it. Most of the trip you are 100′ or so above the creek, and you can only hear it, not see it. It was a glorious day, with beautiful blue sky and relatively warm temperatures (70s probably). 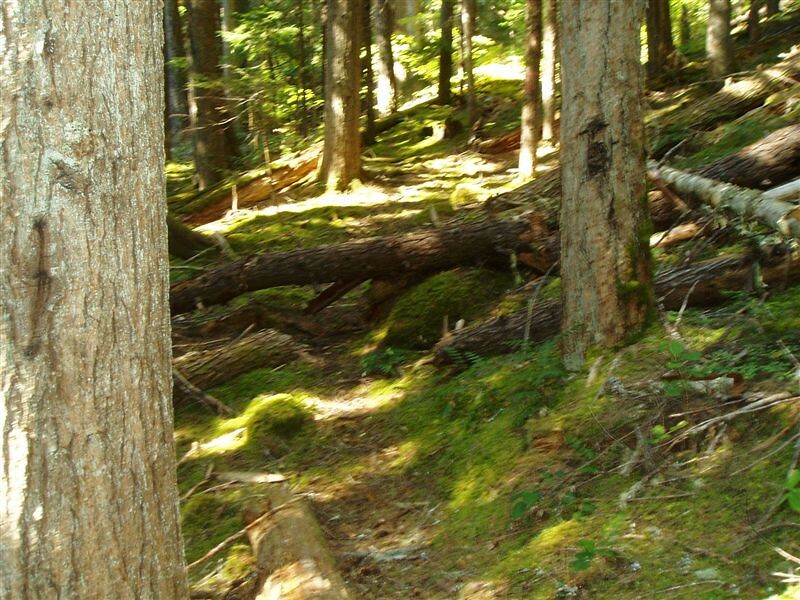 One of the most interesting things on the trail is where the trail just disappears beneath a carpet of moss. The trail hasn’t been used for so long that it just got overgrown with moss. Other parts of the trail had oregon grape or salal growing right in the middle of the trail tread. I ended up hiking about 2 miles up the trail, up to the point where I hiked on the 17th. After that point, the trail seems to get less interesting. The lower half of the trail is much more interesting than the upper half. Probably hiked 4 miles or so.